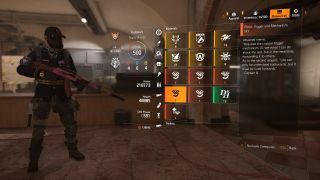 Pick up The Division 2's exotic pistol Liberty with our handy guide. Aside from pre-order rewards, Liberty is probably going to be the first time you encounter anything to do with exotics in The Division 2. However, getting all the pieces together to craft it for can be complicated and time-consuming if you don’t know what you’re doing. Exotics are a mixed bag. Some are genuinely useful, while others are hardly worth the exotic components you get from deconstructing them. Fortunately, the Liberty is the former, offering up three talents that can help against some of the toughest enemies in the game. The first talent is also called Liberty. Any hostile electronic (including weak points, turrets, drones, the BIGDOG-walker-robot-thingies and the RC cars) are highlighted when you aim. Liberty also buffs the pistol’s damage dealt to these electronics by +100%. On the one hand, learning enemy weak points isn’t too difficult and, once you do, a big part of this talent becomes pointless. On the other, it will still help you identify priority targets in a busy firefight, because it is incredibly easy for things like RC cars to slip past your defences unnoticed. Next up is Blind Justice, which works in tandem with Liberty. Once you’ve destroyed a weak point or enemy electronic, your next shot will deal a whopping +500% weapon damage. If that single shot kills an enemy, your magazine is refilled and granted +100% weapon damage. There’s a hell of a lot of experimentation to be had with Blind Justice, and it’s what takes the Liberty into a middling pistol to a very, very viable sidearm. That +500% weapon damage shot is great against minigun tanks, who then quickly regenerate their weak point (the minigun’s belt sticking out the side) to let you do it all again. You could also abuse drone operators for a near-constant damage boost by destroying their drones in mid-air, using the +500% to kill a different enemy, enjoy the +100% damage magazine, and then destroy the next drone they throw out to do it all again. The final talent is Independence. While holstered, destroying a weak point will refill 20% of your currently unholstered weapon’s magazine. This is a great benefit to almost any weapon type, but it’s especially great for weapons with long reload times like light machine guns and marksman rifles. With a big enough group and good enough aim, you could go an entire fight without having to reload. As mentioned, Liberty is probably going to be the first time you encounter any exotic. That’s because the first part of it drops from the final boss of the Capitol Hill stronghold the first time you play it—a requirement to progress to the first World Tier where exotics finally come into play. Kill Captain Kendra Nelson at the end of the Stronghold and they will drop the first component of the Liberty, Pistol: Trigger & Mechanism. From here, you’re going to have to finish three more missions on any difficulty above Story. Once you’ve transferred to World Tier 1, The final bosses of American History Museum, Viewpoint Museum and Space Administration HQ will drop the Pistol: Receiver & Paintjob, Pistol: Sight & Rail, and Kendra’s Liberty Blueprint, respectively. Aside from the Trigger & Mechanism, none of these are guaranteed drops. Weirdly, I had a much easier time making each component drop while playing on Normal difficulty than on Hard or Challenging, so don’t be afraid to drop your difficulty if you’re grinding and the part just isn’t dropping. The next step is where the real random element of the Liberty comes into play. You’re going to want to find a high-end D50 sidearm with a gear score of at least 250 (the cap for World Tier 1 is 300, so you’re fine at any tier). A common point of confusion lies with the D50 rewarded as a Survivalist perk—this one doesn’t count towards the Liberty, so you’ll have to go out and grab a new one instead. The D50 is technically a bog-standard weapon, so anywhere weapons drop, so can the D50. Enemies, chests, bounties, the Dark Zone, missions, there’s no single place where it’s more or less likely to drop. There are more efficient ways of grinding for it, though. The best way to find one is by completing specific open world activities and collecting the rewards. Territory Control areas are excellent, as they’re shorter than fully fledged Control Points but still guarantee a gear chest as a reward. Alternatively, you can complete Control Points and plunder their supply rooms—remember to check the supply rooms of Control Points you’ve already recaptured, as they restock each day and you won’t have to do any fighting to get them. Like every other piece of loot, playing with very generous friends will mean an extra three chances for the D50. It took me a solid day of grinding activities for one to drop while playing solo, and that’s considered lucky. Some people have gone hundreds of hours without seeing one, while others seem to have them coming out of their ears. Once you’ve found a D50, don’t equip it. Instead, head back to the crafting bench at the White House. While it’s always best to be at World Tier 5 with a fully upgraded bench before making any exotic to get the highest possible gear score, you should have all the parts needed to craft one at any time you like. Just add 25 Carbon Fiber and 82 Receiver Components and the Liberty is yours. Aside from finding a valid D50 for crafting, the Liberty is one of the less frustrating exotics to get, as it requires less schlepping around than the Chatterbox or grinding out missions like the Merciless and Sweet Dreams. It’s a surprisingly decent weapon too, it’s not going to have a central focus in anybody’s loadout, but its talents that can have a tangible benefit to any build. Plus it’ll help you target weak points, which, from personal experience, is something a lot more people could stand to get better at. Please, be a good team mate: shoot weak points.